In 2016, the El-Hibri Foundation announced a new award to celebrate collaborative leadership within the American Muslim community. These leaders havesuccessfully mobilized American Muslim communities, promoted inclusion, and developed resources and collaborative relationships necessary for catalyzing positive social change. We believe community building is working across difference to foster relationships, trust, and respect in order to build resilience and capacity to solve complex social problems. The Community Builder Award intends to celebrate and elevate the efforts of those working to transform their communities and improve society. It is designated for early to mid-career American Muslim leaders (typically between the ages of 24 and 40) committed to creating inclusive communities and building capacity for others to create social change. Nominations will be considered for an early to mid-career US-based American Muslim leader that has demonstrated significant achievements in building inclusive communities and empowering others to act. Only nominations received before Wednesday, May 1, 2019 through the online nomination form will be eligible. Individuals may nominate themselves or others for this award. Catalyzing collective impact: Demonstrated outstanding leadership in advancing collaboration, coalition-building, and collective action within American Muslim communities and/or in partnership with allies. 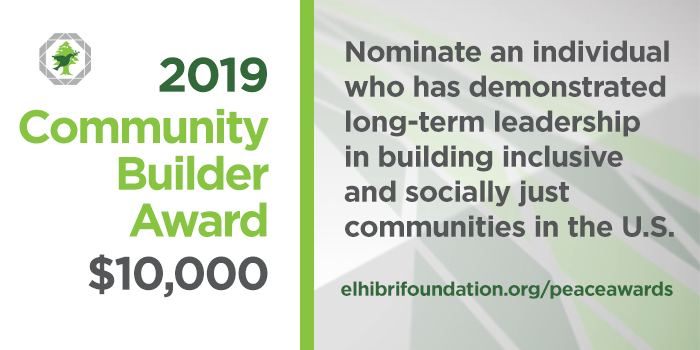 The Community Builder Award is awarded based on a ranking of criteria from nominations received through the online form during the open application period. Members of the Community Builder Award Selection Committee include experts in American Muslim community organizing and community building. The selection process may include interviews with references familiar with the nominee’s unique contributions to building and sustaining inclusive communities. Nominations for all awards are accepted until 11:59pm EST (DC Time) on Thursday, May 2, 2019. Award winners are announced in the fall and presented at the El-Hibri Foundation's annual Peace Awards Ceremony. Please direct any inquiries to info@elhibrifoundation.org.